Five years after releasing its most advanced Optima midsize sedan yet, Kia is not resting on its laurels. Indeed, the Korean automaker has moved the Optima forward a full generation, by presenting a new design with European styling, an updated premium cabin, and improved ride and handling. 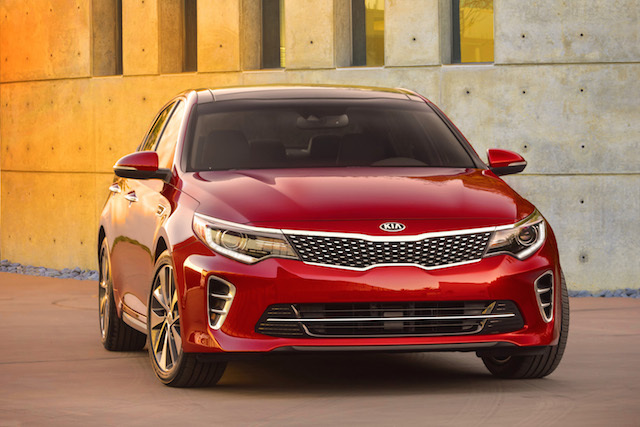 The front-wheel drive, five-passenger Kia Optima has steadily been making inroads within the ultra-competitive midsize segment, even as its chief competitors release new and updated models as well. The Toyota Camry remains the segment’s top seller, with models from Nissan, Ford, Honda, and Hyundai also making a statement. Kia says that the 2016 Optima’s chassis is longer, wider and stiffer than the outgoing model, providing improved handling for the new version. The latest edition will be built at Kia’s manufacturing plant in West Point, Georgia, and will feature five trim levels, including a US-exclusive SXL. One naturally aspirated engine and two turbocharged engines will be offered. The available 1.6-liter turbocharged four-cylinder will come paired with a 7-speed dual clutch transmission, producing 178 horsepower at 5,500 rpm and 195 foot-pounds of torque at 1,500 rpm. A 2.4-liter naturally aspirated four-cylinder is standard and rated at 185 horsepower at 6,000 rpm and 178 foot-pounds of torque at 4,000 rpm. Also available is a 2.0-liter turbocharged four-cylinder engine, producing a model leading 247 horsepower at 6,000 rpm and 260 foot-pounds of torque at 1,350 rpm. These two engines are paired with a six-speed automatic transmission with manual shifting capabilities. 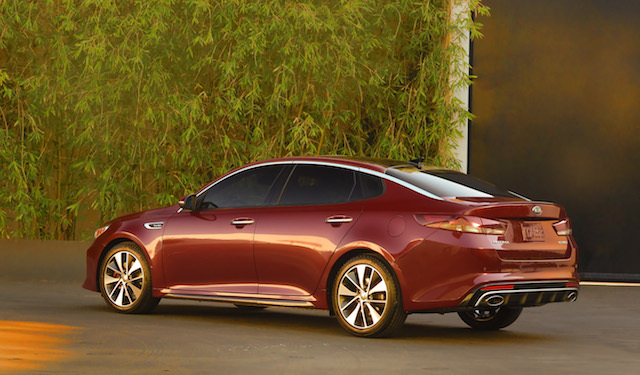 The 2016 Kia Optima has been extended by 0.4 inches and now sits on a 110.4-inch wheelbase. It also measures one inch wider at 73.2 inches. The changes also extend to more storage capacity in the trunk. Notably, the new Optima borrows something from the top-of-the-line K900. Specifically, this sedan features a sinister front fascia, strong wheel well arches and sweptback headlights. The 2016 Optima also introduces bi-functional HID headlights along with available Dynamic Bending Lamps and High Beam Assist – what illuminate the road while you travel around the corners. The Optima’s silhouette is at once familiar as it is rakish. The sharply angled A pillars return as do the bending C pillars that give this sedan its sporty character. Notched rear windows, carved rear fenders and a raised deck lid enhance this sedan’s countenance. Buyers will be provided with standard 16-inch wheels with increasing larger wheels of up to 18 inches available. New wheel designs and exterior colors complete the exterior updates. Inside, the Optima’s cabin is replete with soft touch materials, with detailed stitching along the dashboard and doors. Metallic accents appear in upper trim level models, and buyers have a choice of cloth, leather or Nappa leather seating surfaces. A six-speaker audio system is standard and a 14-speaker Infinity audio system is available. Various technologies are available raining from a rear camera display to a 360-degree around view monitor. Safety features available include smart cruise control, blind spot detection, rear cross traffic alert and autonomous emergency braking. 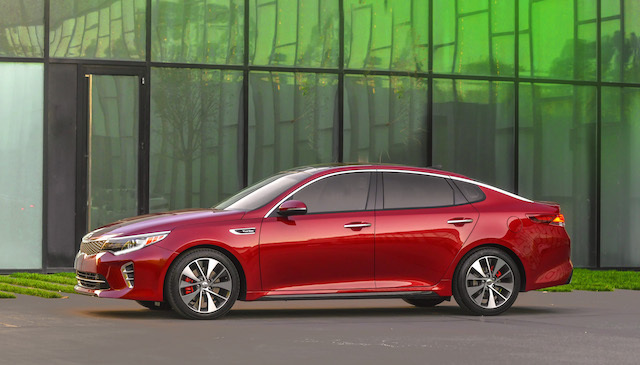 Sales for the 2016 Kia Optima begin in the fourth quarter of this year. Photos courtesy of Kia Motors.